Page contains photo and short narrative about the settlement's young female children --their hardships, their labor at home to help their mothers. 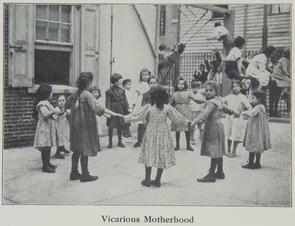 Black and white photo depicts about ten girls standing in "ring around the rosey" formation on back patio. Other children can be seen playing in the background.